I guess the best place to start this story is at the beginning, right? Well it all started in a little coal mining town named Fall River, West Virginia, in McDowell County. The towns were known best as “Coal Camps” Fall River doesn’t exist today, it has long since been absorbed by the town of Roderfield. The date was 3 June, 1918, I was born at home, delivered by Doctor Herman Tutwiler who was the company doctor. I believe that every baby boy delivered by Doctor Tutwiler was named Herman. I knew at least eight boys named Herman and there were four in my class in school. I was the first boy in the family of five children. It may be helpful to describe the camp and its demography. There were probably 50 to 75 houses in the camp, housing about 175 people. The mine employed approximately 75 to 100 miners of which, about 30 were foreign born or black. The Company had the mine and the town pretty well organized and was fairly well self-sufficient. There was a well-stocked company store that sold everything from shoes to beefsteak. Each morning, the wives or older children would go to the company store to do their daily shopping. Each one had a “script card” which enabled them to draw script that could be exchanged over the counter in the store the same as cash. The amount of script drawn was debited against the miner’s wages and deducted from his pay. On pay-days, if the miner had anything left, there would likely be a shopping trip to Roderfield or catch the train to Welch for some big time shopping. There was a theater which had a movie, comedy and a serial on Saturday nights. How well do I remember Tom Mix, Buck Jones, Ken Maynard and Harry Cary as my favorite cowboys and “Perils of Pauline,” as my favorite serial. Harold Lloyd and Charlie Chaplain were big-time comedians. The projector was the carbon arc-type, which made the characters a little shaky and jerky at times but what the heck, we enjoyed them as much or more than modern movies. We also had other forms of recreation, such as fights with the colored folks. There was intense segregation in those days and every time we caught the colored people in our swimming hole, there was hell to pay. Sometimes we won and sometimes we lost but in the end, it was settled until the next time. Tug River circled around the back of the camp and so it furnished a lot of pleasure for us. We swam, boated, and fished in the summer time and skated on it in the winter. Grammar school, primer through sixth grade was located in Roderfield, about 2 miles down the road. Junior High was about 6 miles in the opposite direction in Big Sandy. It sure was tough on the small kids wading up to 2 feet of snow to get to school in the winter time and go to school we did. There was no such thing as a snow day for us. We went to school and were spanked if we were late. High School was located in Welch, 15 miles up Tug River and by golly, they operated a school bus to it. The house in which I was born is still standing today and in pretty good shape, too. We probably lived there about a year and then moved to Roderfield. 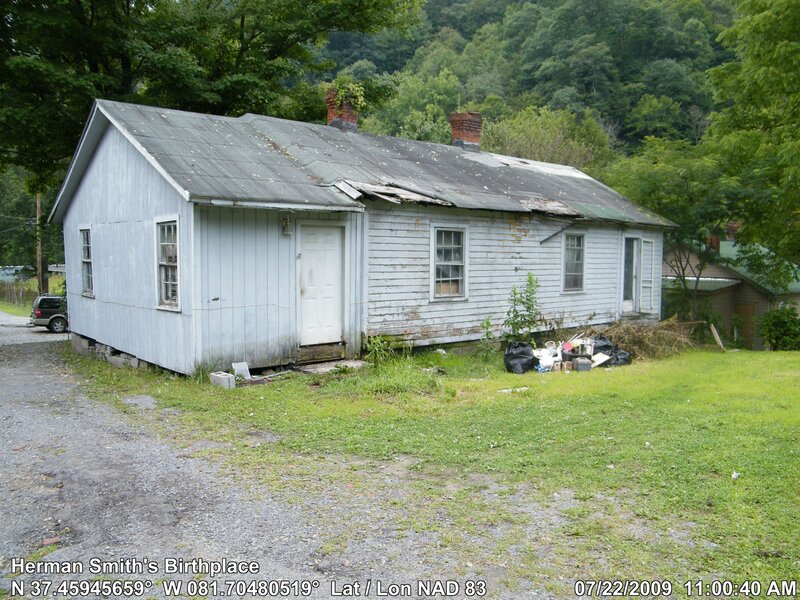 The little old house that we moved into, wasn’t much better than a shack. It had 3 rooms with a porch all the way across the front. I well remember waking in the middle of the night by dogs barking in the distance and the weird noises made by a bunch of guineas that mom had. Seems as if I stayed half-scared to death so long as we lived there. Herbert was born in this house on September 23, 1920. We probably lived here about a year when dad decided to move to Kentucky which turned out to be a big mistake. Marie was born on April 21, 1923 while we lived at TeeJay, Kentucky. There were a couple of things that happened to me while we lived at TeeJay that may be worthy of mentioning because I may well not have been here today had things turned out a wee might differently. A group of older boys had obtained a 50 pound carbide can some where and it had about 2 pounds of carbide left in the can. The big boys punched a nail hole in the back of the can, set a tomato can full of water in it, screwed the lid on tightly and pointed it across the river. The trick was to roll the big can over a little to wet the carbide, put a flame of some sort to the nail hole and run. Do you know what happens when water and carbide are mixed? Acetylene gas happens which is highly explosive. One can guess very accurately what happened when I stuck a lighted piece of paper to that nail hole. That can exploded and blew that lid into the next county and the can passed me somehow and landed about 200 feet in the opposite direction. It knocked me about 10 feet away with only a loud ringing in my ears as a result. Talk about luck and The Good Lord looking out for someone, it took both for me to walk away from that caper. On another occasion, this 5-year old found himself in another awkward and dangerous situation. This may well have happened when Floyd and Obra were on their way to get married. 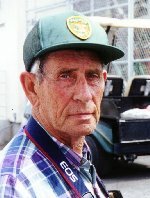 Floyd had driven a buggy pulled by old Jim Bob, across the ford in the Cumberland River to pick up Obra. When they pulled out of the yard, they didn’t know they had a hitch-hiker hanging on the back of that buggy. The ford was very shallow and rocky. Well, about half way across the river, I had about as much bouncing around from my narrow perch as I could stand and I was thrown off. I landed on my back and my head hit a big rock. Floyd and Obra were not aware of the situation that I was in and I think it was again, a miracle of God that I wasn’t knocked unconscious and drown. The third incident that seemed to prove that I was the luckiest kid alive, happened when we were moving into our new house in TeeJay. The moving men carried the bottom half of our kitchen cabinet into the kitchen and set it up against the wall. Then they brought the top half in and placed it on top of the bottom half and didn’t bother to screw the two together at that particular moment. The top half was filled with jars of jelly and jam that mom had canned at Varilla. There was a young’un in the household with nothing to do but explore, plunder, or whatever he could get into. A chair was pulled up close to the kitchen cabinet and I proceeded to climb up to get me some sweet stuff. I made a big mistake when I reached up to pull myself closer to the jelly. The result.... I pulled the whole top of that cabinet over on me and cabinet, jelly, jam and broken glass all over the kitchen floor was the result. Don’t know why it didn’t mess me up pretty bad, but I only had a cut in my head at my hair-line and I still have the scar to this day. Believe me when I say I was glad that mom and dad decided they had better get the heck out of Kentucky before they had a funeral bill to pay. In a short while, we were back in Fall River, West Virginia. I must have been six years old about this time and started school. The first year of school was called the Primer. It was a little more advanced than kindergarten is today. We learned our ABCs and learned to read from our Primer. It was all about Baby Ray and his little dog Penny and his two cunning kitty-cats. Our first day at school was strictly one of familiarization. We were introduced to one another, met our teachers, was read the riot act about things we could do and those we had danged well better not do and most importantly, we obtained a list of books and supplies that our parents had to purchase. There was no such thing as the school furnishing books or supplies. Our grammar school had big, double doors leading inside to the cloakrooms. This is where we hung our coats and sweaters and there was a long shelf where we stored our lunches. When the dentist made his annual visit, he set up his equipment in one of the cloakrooms and we had to double up on the other one. The school house had three large rooms, the small room where the Primer, first and second grades were taught, the middle room housed the third and fourth grades and the big room held the fifth and sixth grades. Each room had only one teacher. When she was teaching one grade, the others were studying their assignments. One hour was devoted to each class and believe me when I say we had darn well be studying. Any talking or whispering would surely bring on a paddling. School started at eight with a ten-minute break at ten to go to the outhouse or get a drink of water, a half-hour lunch period at twelve and another break at three and dismissed at four thirty. We took a year-end test to earn a promotion. If we failed the test, we repeated that whole year, period. When we successfully completed the sixth grade at Roderfield, we started Junior High School at Big Sandy. I dearly loved school and all my teachers. I particularly remember how sweet my third and fourth grade teacher was. Her name was Nellie McCauley and she was the most patient person I’ve ever known. Mizz (now known as Ms) Duncan was the Principal and taught fifth and sixth grades. I must have done OK in school because I had completed the sixth grade before I was eleven years old. Guess they promoted me to get rid of me. My grade school house burned the next year and they built a new brick school about a half mile from the old location. The house we moved into when we came back from Kentucky was a large six room duplex. We lived in three rooms and George Walls and his family occupied the other three rooms. Looking back, I don’t know how a family of eight could possibly crowd into three rooms. The rooms were large enough to set up two beds in each room though, which made it possible, I guess. Of course, one room was used for the combination kitchen-dining room. We only lived in this house a couple of months, when a much larger and better house across the road became available and we moved into it. It had three bedrooms, a living room (which we called the front room), a kitchen and separate dining room. We were living in high cotton, now. My brother and I were getting large enough to do chores and that didn’t go over too well. It interfered greatly with our play schedule. Herbert was assigned to carry in the coal and I was to gather the kindling to start the morning fires. We had a Burnside, coal-burning space heater that looked like a boiler and it really made short work of a pile of coal. Coal was only a dollar a ton, delivered. A ton would last about a week in the wintertime. Besides, there was the cook stove that had to be supplied, also. Then there was wash day. Our sisters believed in washing everything in the house, on Tuesday. We had a large Thor electric washing machine that took two number two wash tubs full of water to fill. Then there were two rinse tubs and a blueing tub. Can you imagine how much water it took to wash our clothes? ONE -HUNDRED and FIFTY GALLONS of water each week. We carried this water from a pump about a hundred yards away in ten-quart buckets. After a while, Herbert and I made us a big cart on which we placed four tubs. I pulled and he pushed but too much water sloshed out to make this venture pay off. I think the Company ran a water line down close to our house that helped alleviate the problem. My sisters would shave about two cakes of P&G soap into the washer and insert the clothes which were tumbled inside a big rotating drum until the clothes were clean or torn to shreds one or the other. Then they were run through two rinse tubs, then through the blueing tub. I was in junior high school when I discovered the secret of blueing. You see, the clothes had a yellowish tint to them because of the soap and maybe a little lingering dirt. Now a mixture of yellow and blue makes white, hence the clothes came out of the blueing, not blue, but white. There was no such thing as clorox at that time. It came later and eliminated the blueing process. I previously mentioned the big Burnside heater that we had to keep supplied with coal, but there was also the big Home Comfort kitchen range that required a lot of coal, also. The range had four eyes on top which could be removed with a “lid lifter” so we could stoke it with coal. Below the coal bed were the grates which supported the burning coal. About every half hour or so, we would have to insert a crank called the shaker, on the grates and rock the shaker back and forth about six times to make the ash fall down into the ash pit, which was a sort of a drawer that had to be emptied frequently. On the right side of the stove was a water tank that would hold about five gallons of water and it stayed hot all the time. This water was used for bath water and washing dishes. There was a large oven down below and a “warming closet” above the stove top. The warming closet was used to keep leftovers hot. There were almost always a few biscuits or cornbread, a couple of pork chops or sausage, and maybe some good old milk gravy to be found in the closet. On the back of the stove top, there was always a pot of coffee, hot and strong for the brave ones. NORTH WILKESBORO - Herman Edward Smith, 84, passed away at his home on Elledge Mill Road in the Mulberry Community of Wilkes County on Saturday, July 27, 2002, following a more than nine-year bout with cancer. He is survived by his wife, Betty Mangum Parker Smith of the home; his son, Larry E. Smith and daughter-in-law, Amanda E. Smith of West Jefferson; three stepchildren, Anita Parker Briley of Tarboro, Larry Lee Parker Jr. of Tarboro and Annette Parker Worrell of Colonial Heights, Va.; three grandchildren, Timothy G. Smith of Denver, Colo., Mark Smith of West Jefferson and Leslie Smith Sorrells of Rocky Mount; a brother, Herbert Smith of West Columbia, S.C.; two sisters, Alice Marie Smith Robertson of Columbus, Ohio and Gloria Anita Smith Hogsten of Columbia, S.C.; four great-grandchildren, Noah Smith, Heather Smith, Amanda Sorrells and Medford Sorells; and eight stepgrandchildren. Herman was preceded in death by his first wife, Lillian Marie Elledge Smith, daughter of James Blaine and Mary Jane Burchette Elledge; a brother, Shirlie Howard Smith; and five sisters, Olivene Smith, Obra Ethel Day, Hazel Izetta Gills, Nellie Mae Clagg and Kathleen Edith Coffman. Born on June 3, 1918, at Fall River, (now Roderfield,) McDowell County, W.Va., Mr. Smith was the son of William Noah and Laura Della Harman Smith; the grandson of Allen and Emily Bishop Smith; great-grandson of John Fletcher and Mary Lester Smith; the great-great-grandson of Isaiah and Elizabeth Fletcher Smith and the great-great-great-grandson of Revolutionary War veteran, Shorten Smith. He was a retired electronics engineer from FASCO Industries in Fayetteville. Prior to FASCO, he worked for more than 20 years as an air-electronics maintenance foreman at Pope Air Force Base near Fayetteville. He was a proud veteran of World War II, having served with the U.S. Navy, then served in Korea with the U.S. Army. He reached the level of captain in the U.S. Army Reserves after serving in Korea. Prior to World War II, he worked as a coal miner and mine foreman in Premier, W.Va. He was a member of the Baptist Home Baptist Church in Mulberry and an active member of VFW Post 1142 in North Wilkesboro. He was also a member of a team of U.S. Park Service personnel, which included his grandson, Timothy G. Smith, and volunteers who found the sunken Civil War submarine, H.L. Hunley, in Charleston Harbor in 1996. He was an ardent student of the Civil War and could relate from memory his studies of recorded details of almost every battle. For more than 25 years he has shepherded an annual reunion of his siblings and more than 200 of their descendants. He enjoyed genealogy research on his family and was an avid user of the Internet, e-mailing his "buddy list" almost daily. Herman Edward Smith, husband, father, stepfather, grandfather, great-grandfather, brother, uncle, and friend, will be missed by everyone who knew him. Truly, A Giant Has Fallen. The funeral service will be held at 11 a.m. Monday, July 29, at Baptist Home Baptist Church with the Rev. Paul Corner, the Rev. Rex Eldreth and the Rev. Harvey Clark officiating. Burial with military rites by VFW Post 1142 will be held in Mountlawn Memorial Park. The family will be at Miller Funeral Service, 180 Sparta Road, North Wilkesboro, from 6:30 to 8:30 this evening. In lieu of flowers, memorial may be made to VFW Post 1142, P.O. Box 357, North Wilkesboro, NC 28659, orHospice of Wilkes, 1907 West Park Drive, North Wilkesboro, NC 28659.